Nesting has me doing really crazy things this pregnancy. I’m organizing weird stuff and have a random list of projects that MUST HAPPEN OR ELSE. Seriously, you guys … I’m in the midst of unpacking all the tubs in our garage and color coding them based on their contents. Girl clothes are all in pink, boys in dark teal, collective children items like dress-up and winter wear are in light green. I’m driving myself, and Dominic, no doubt, batty with my insistence on organizing all. the. things. The madness has overflowed to the blog and one such project was to figure out how to create recipe cards. I know I don’t post the most fascinating recipes (today is a big exception, I promise! ), but I do have nostalgic thoughts that someday Jemma will Google her ol’ ma looking for a recipe I once made during my blogging days. So, blog recipe cards made my to do list! I’m actually planning to reorganize a whole slew of things around here, but this was the first, and most manageable, step. And, as you can see … I was successful in my efforts to navigate the world of WordPress plugins! Go me! And thank the blogging gods for sparing me the stress of a hormonal breakdown! Now, on to the most divine dinner you’ll ever make! It calls into the categories of Meatless Monday, Comfort Food, and Freakin’ Fabulous. Friends, may I introduce my Fall + Winter food love —> Red Wine Risotto. Just typing those words makes my belly grumble and my heart leap. It’s that good. Super flavorful, super easy, and best of all, unlike traditional risotto where you have to stand over a hot stove stirring stirring stirring, this particular recipe calls for 30 minutes in the oven instead! Boom! Totally witching hour friendly. Now … look at this! You can print or pin this recipe with ease! You are so welcome :) High five for me and my increased techy-ness! I tend to prep one large squash ahead of time and then use it in a few different meals. 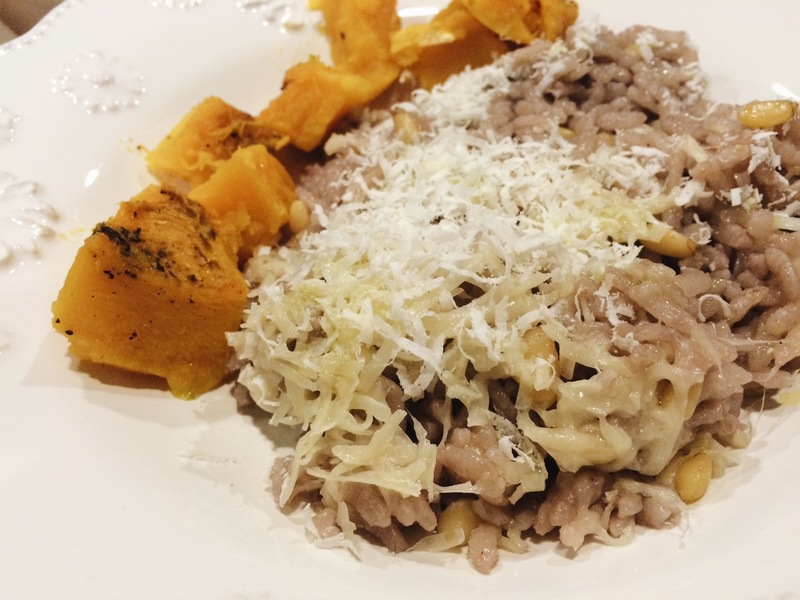 So, in theory, when I begin mixing up risotto, I already have roasted squash on hand. To perfectly roast a squash, cut it into wedges (have mercy and be super careful). Lay on a large baking sheet and generously drizzle with olive oil and sprinkle with salt and pepper. Bake at 425 degrees for 30 minutes hour. Remove skin and cube or mash the squash flesh. Heat butter and olive oil in medium dutch-oven or cast iron on the stovetop over medium heat. Once heated, saute chopped onions for 5-10 minutes. Stir in garlic for a minute or two. Add uncooked rice and stir, toasting for a few minutes. You'll know it is toasted when you start to see it turn golden brown on the edges. Stir in the red wine and reduce. No liquid should be visible before moving on to the next step. Pour in the chicken stock. You now have a soup-y mess. But never fear! Cover tightly with lid or foil and place your dish in the oven for 30 minutes. All of the the remaining liquid will absorb during the baking process and leave you with amazingly tender risotto rice. Remove from the oven and stir in parmesan and pine nuts. Add a hearty serving of roasted squash on the size and drizzle it all with a white truffle oil. Of course, the grocery store is your oyster when it comes to risotto mix-ins. You can literally add anything! The above recipe is my favorite combination, but go ahead and give grilled chicken, peppers, roasted broccoli and other cheese blends a try! With risotto you'll rarely, if ever, go wrong.